Hillary Clinton is the most popular political figure in the country. 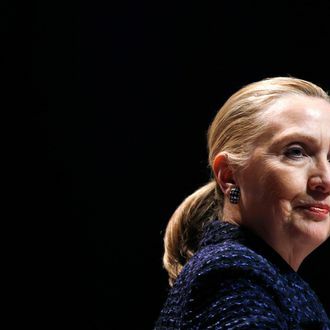 According to conventional wisdom, the Democratic presidential nomination in 2016 and possibly the White House itself are hers for the taking, if she so desires them. When Hillary Clinton walks the streets, crowds of people trail behind her to pick the flowers that bloom in her footsteps. And yet, according to a Quinnipiac poll, the largely Democratic voters of New York City, by a margin of 51–46, do not want Hillary Clinton to run for mayor, as Mayor Bloomberg hilariously reportedly proposed. The only explanation that makes sense is that New Yorkers, in their boundless generosity and selflessness, couldn’t bear to keep Clinton for themselves and thus deprive the rest of the country of her leadership.